"Sweet peas and basil are tossed with twisty pasta in this easy, delicious dish." Heat the olive oil in a saucepan over medium heat. Stir in the green onions, and season with seasoned salt. Cook until green onions are golden brown. Mix in the peas with liquid and basil, and continue cooking until heated through. Toss with cooked pasta to serve. 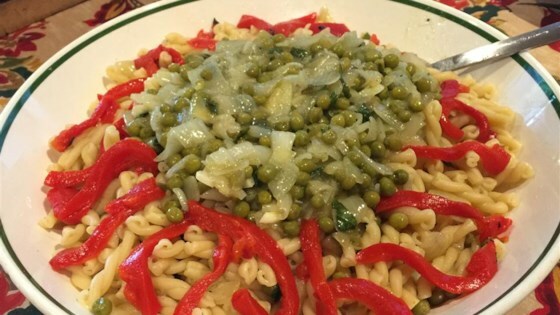 See how to make tasty and inexpensive pasta with peas and white beans. Super-easy to make, and the basic ingredients are fanastic to start with! I'd recommend adding some more veggies and/or seasoning if you want a bit more of a flavor. Overall, it was great. I used frozen peas and added garlic, fresh ground pepper and a little fresh grated parmesan and this was a keeper. I'm sorry but this was just incredibly bland. This was even after adding roasted garlic to give it some flavor.